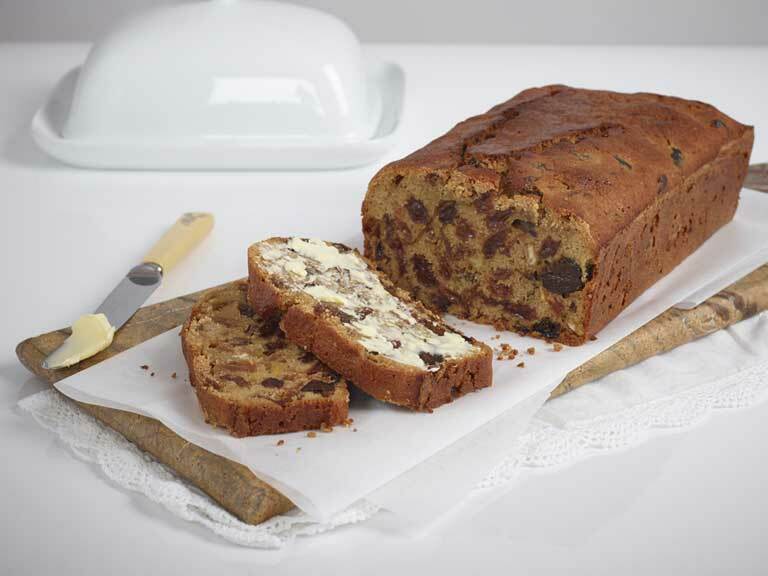 A delicious gluten-free and dairy-free fruit loaf that's ideal for afternoon tea. 1. Put the tea bags into a jug, add the boiling water and leave to stand for 10 minutes. 2. Line a 1kg/2lb loaf tin/bread tin with parchment and pre-heat the oven to 180°C, Fan 160°C, 350°F, Gas 4. 3. Weigh the dried fruits into another bowl. If using prunes, dates or apricots cut these into quarters. Pour the tea into the bowl and leave until completely cold. 4. Sieve the flour and baking powder into another bowl, add the sugar and mix together. 5. Add the egg (or chickpea flour and water mixture), oil, grated orange rind and juice and beat well. 6. Discard the tea bags and stir the soaked fruit and liquid into the bowl. 7. Tip the mixture into the prepared tin and smooth the top. 8. Bake for 70-75 minutes. 9. Gently turn out the cake onto a wire rack and leave to cool. This recipe is free from gluten, soya, dairy and nuts. When using the chickpea and water mixture instead of the egg the recipe is suitable for vegans.